“Ads by CoolWords” is the PUP that uses misleading techniques to prevent removal. Use Reimage to locate malicious components and get rid of them faster than with uninstall instructions. A full system scan blocks virus reappearance and prevents traffic to malicious domains. How can CoolWords hijack my computer? How to remove CoolWords virus? CoolWords is an adware type program, so you should dedicate some time for thinking whether you need this program on your computer or not. No matter that it is not considered malicious and it can hardly pose harm to your computer, there are some activities that are usually caused by it. Beware that it can easily start showing you annoying pop-up advertisements during your browsing. They can be filled with notifications about great deals, price comparisons and similar ads that seek the only thing – to redirect you to related websites. If you want to protect yourself from Cool Words redirects to insecure and very suspicious websites, you should ignore each of its ads. Beware that they may start appearing on your PC’s desktop out of nowhere because this browser add-on has been actively spread in a bundle with freeware and shareware. This distribution method is still legitimate but we believe that it’s just a matter of time. Fortunately, you can avoid it by suing our tips that are given in the next paragraph of this description. Make sure you use them each time when you install freeware on your computer. If CoolWords adware has already started causing annoying pop-up ads, in-text links and similar content on your computer, make sure you avoid it because they may lead you to more serious problems. If you have ever noticed “Ads by CoolWords”, “brought to you by CoolWords”, “CoolWords ads”, “by CoolWords and similar notifications during your browsing, you should stay away from these ads because they are clearly displayed by adware that is hiding in your computer. In this case, you should find this web browser plugin, which has infiltrated your computer unnoticed and remove it. For that you can use Reimage or other reputable anti-spyware. Otherwise, you may allow CoolWords to hijack all of your web browsers and start showing its pop-up ads, advertisement banners and in-text links. Please, do NOT click these notifications because they may lead you to suspicious websites! CoolWords adware has been propagated online just like any other adware-type program. In order to avoid installing such potentially unwanted programs from the Internet, you should be very careful when downloading free downloads from the web. In most of the cases, they don’t bother to warn people that other software will also be installed on the system. However, you can prevent its installation by choosing Custom or Advanced installation method of the freeware and then unchecking check boxes that agree with CoolWords and other adware installation. If you noticed “Ads by CoolWords” and similar notifications, it’s a sign that you should check your PC for potentially unwanted programs and remove them from the system. Otherwise, you should be prepared for CoolWords redirects and similar issues. Here, look for “Ads by CoolWords” or any other recently installed suspicious programs. Wait until you see Applications folder and look for “Ads by CoolWords” or any other suspicious programs on it. Now right click on every of such entries and select Move to Trash. When in the new window, check Delete personal settings and select Reset again to complete “Ads by CoolWords” removal. Once these steps are finished, “Ads by CoolWords” should be removed from your Microsoft Edge browser. Here, select “Ads by CoolWords” and other questionable plugins. Click Remove to delete these entries. Now you will see Reset Firefox to its default state message with Reset Firefox button. 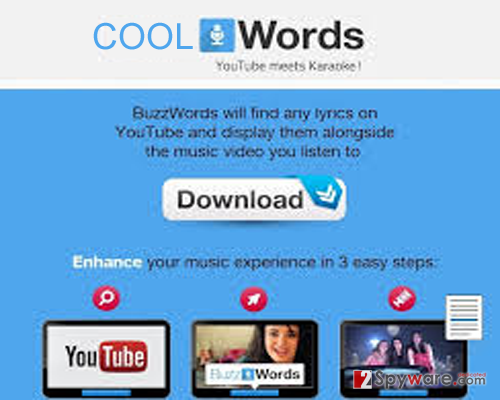 Click this button for several times and complete “Ads by CoolWords” removal. Here, select “Ads by CoolWords” and other malicious plugins and select trash icon to delete these entries. Click Reset to confirm this action and complete “Ads by CoolWords” removal. Here, select Extensions and look for “Ads by CoolWords” or other suspicious entries. Click on the Uninstall button to get rid each of them. Now you will see a detailed dialog window filled with reset options. All of those options are usually checked, but you can specify which of them you want to reset. Click the Reset button to complete “Ads by CoolWords” removal process. This entry was posted on 2015-09-21 at 06:03 and is filed under Adware, Viruses. You can quickly scan the QR code with your mobile device and have “Ads by CoolWords” virus manual removal instructions right in your pocket. How did you remove “Ads by CoolWords” virus?